Practice Machine Drawing questions and answers for interviews, campus placements, online tests, aptitude tests, quizzes and competitive exams. This set of Machine Drawing test focuses on “Preliminary Decisions for Making a Drawing”. Explanation: The first preliminary decision for making drawing is types of projections. There are two types of projections which are used in industry are first angle method and third angle method. Find the type of projection method which is used in the industry follow the same in types of projection. Explanation: Object orientation is the object can be placed in several positions with respect to the projection plane. When the object is oriented in such a way that its faces are parallel to picture plane is the simplest view of viewing. 3. An object is placed at an angle with picture plane________ the drawing. Explanation: An object is placed at an angle with a picture plane complicate the drawing unnecessarily. It is the most important parameter which is used in object orientation. From that point of view the object should be oriented by the proper angle for best viewing. 4. __________ of the object should be the largest of all the other views. Explanation: Front view of the object should be most important or largest of all other views. Also, it shows the maximum part of the object or maximum details of the object. Selecting View is another rule or decision which is used in making a drawing. 5. Which side view gives more details about the object? Explanation: Right hand side view gives more details about the object as compared to left side view. Side view is either left or right side depending upon which side gives more details about the object. Two views are also given if one side view does not clear all dimensions of the object. 6. The number of views to be drawn depends upon the _______ of the object. Explanation: On the shape of the object number of views is to be drawn. The number of views is the preliminary decisions for making a drawing. A rectangular object has six phases but only three views are easy for understanding. Explanation: Axis symmetric objects may require only two objects, because of their axis symmetry property. Because of that there are only two views is required. Both two views give complete details of the object. Objects having negligible thickness can be shown with one view only. Explanation: By using a selection of scale we can enlarge or reduce the size of the object for better understanding. It is another rule for preliminary decisions for making a drawing. 9. The dimension put on the drawing is _______ dimensions. Explanation: The dimension put on the drawing is the actual dimension and not scaled dimension. Large parts drawing are not fit on the sheet due to this reason the size of the drawing is reduced by reducing scale. Explanation: The reduced scale is 1:2, 1:5, 1:10, 1:20, 1:50, 1:100 1:200, and 1:500. The reduced scale is shown by 1: X and enlarged scale is shown by X: 1. Enlarged scale is 50:1, 20:1, 5:1, and 2:1. 11. A gap of about ________ mm should be kept to accommodate dimensions and view titles. Explanation: In spacing of views, a gap of about 25-40 mm should be kept to accommodate dimension and view title. Spacing of views is another preliminary rule for making a drawing. Views should be placed at a proper distance from the axis for better appearance. 12. For sheets of A3 size, a border is at _______ mm from left and ________ mm for all other sides from the edges of the sheet. Explanation: For sheets of a3 size, border is at 20 mm from left and 10 mm for all other sides from the edges of the sheet. This distance or proportion is selected for the better appearance of view and easy for understanding. 13. If there is another left side view for the object also, extra width is needed. Explanation: There is another left side view for the object an extra width is needed or added. X and Y represent the size of the border. This is the most important rule which is used in making a drawing. 14. A represent the ________ gap and B represent the ________ gap between views from the border. Explanation: A represent the horizontal gap and B represent the vertical gap between views from the border. It is not representing right or left gap. If values of A and B are less than 25 mm, select standard reduction scale. 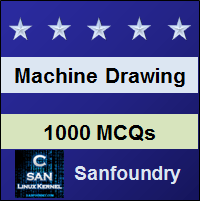 To practice all areas of Machine Drawing for tests, here is complete set of 1000+ Multiple Choice Questions and Answers.